Welcome to the New Albertsjukebox. The world largest 50's and 60's vinyl collection. LPM-1254 very first Canadian original copy in Mint- Condition. Original Canadian printed only in Canada, on the very rare light blue label. This is the first original cover with the light pink and green letters. With the light pink and green square on top right of the cover. In the past 40 years. 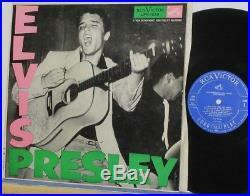 Offer you only the very best quality original 50's and 60' records. 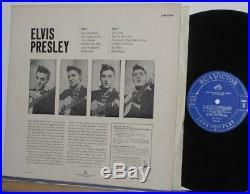 The item "ELVIS PRESLEY LPM-1254 CANADIAN COPY ON THE LIGHT BLUE LABEL MINT- LP" is in sale since Thursday, May 3, 2018. This item is in the category "Music\Records". The seller is "albertjukebox" and is located in Marieville, Quebec. This item can be shipped worldwide. Record Label: RCA Very Rare Light Blue Label.